By Steve Gabriel, crossposted from the Northeast Forest Mushroom Growers Network website/blog. If you’ve been thinking about getting your farm certified as organic but aren’t sure whether it’s worth it, and find all the paperwork and requirements overwhelming, this course is for you. This 6-week online course is facilitated by Laura Biasillo of Cornell Cooperative Extension Broome County and taught by representatives from NOFA-NY LLC (Northeast Organic Farming Association’s certification arm), and designed to demystify the certification process. The course is appropriate for total newbies as well as experienced growers contemplating the transition to organic. It won’t teach you organic production techniques, but will help you understand the National Organic Program requirements, learn who the certifiers are, evaluate whether certification is right for your operation, and walk you through the paperwork. Join weekly live webinars on Tues. nights from the comfort of your living room, and participate in homework and discussions in the course’s online classroom between webinars. You’ll learn from successful organic farmers about why they’ve chosen certification and what considerations might be most important for your farm. The course begins Tues. Feb 12 and runs for 6 weeks. It costs $200 and registration is only open until the first day of the course, or until it fills, whichever happens first. View Frequently Asked Questions about our online courses. View the syllabus and learning objectives or register for BF 106: Organic Certification. This course is just one of many offered by the Cornell Small Farms Program in partnership with Cornell Cooperative Extension. Registration is still open for BF 202: Business Planning (starts Feb 21) and BF 103: Taking Care of Business (starts March 4). Read more about these and other online courses. Via Cornell Small Farms Program January monthly update. Cornell Small Farms Program released its report, 2012 Recommendations for Strategic Investments in New York’s Small Farms detailing the top priorities for enhancing the viability of small farms in New York. The report is based on the February 29, 2012, 4th New York Small Farms Summit, hosted by the Cornell Small Farms Program in collaboration with Cornell Cooperative Extension, a statewide, interactive gathering that engaged more than 150 farmers, educators, policy makers and community members, and a survey of 573 farmers, educators and others. Develop food distribution strategies (e.g. collaborative marketing, product pooling and trucking, food hubs) to expand small farm access to local and regional markets. Document economic impact of small farms on their communities to increase investment in and support of small farms. Develop new and expand existing livestock processing facilities and evaluate livestock processing regulations and policy for impact on small farms. Identify alternative financing strategies accessible to small farms. Advocate for greater investment in small farm services (i.e. research, extension and education). Develop and promote affordable energy conservation and renewable energy sources for small farms. Develop strategies to expand on agricultural land access. 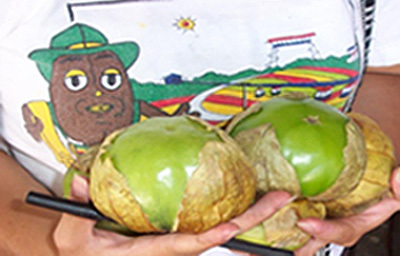 Promote Resources and Education targeting consumer education in local farms and food. 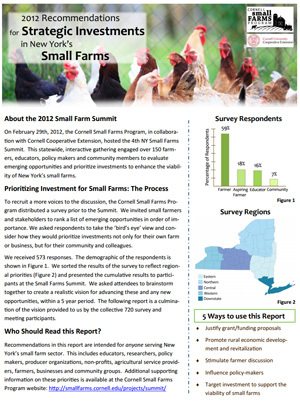 Download the full report and access supplemental material at the Cornell Small Farms Program website. Questions about the report may be directed to Anu Rangarajan, the Director of the Cornell Small Farms Program (ar47@cornell.edu) or the Small Farms Program Office at 607-255-9227 or smallfarmsprogram@cornell.edu. 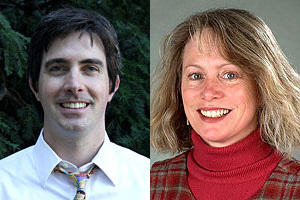 Bryan Duff and Marcia Eames-Sheavly have been selected as members of the inaugural group of Cornell’s Engaged Learning + Research Faculty Fellowship Program. Duff will use the fellowship to help develop a new service-learning course for undergraduate and graduate students. Eames-Sheavly will interview colleagues in the department to discover and document how they use engaged learning and to highlight the Department as an example of engaged learning excellence. The core of the Engaged Learning + Research’s mission is a commitment to professional development and capacity building around engaged learning and research pedagogies and methodologies. The Engaged Learning + Research Faculty Fellowship Program offers an opportunity for participants to develop a project that improves engaged learning and research at Cornell and to cultivate a learning community of engaged faculty leaders who are committed to integrating principles and practices of engagement in their own research and teaching, and who will act as advocates of these practices to their colleagues and students. David Wolfe (right), professor in the Department of Horticulture and chair of the Climate Change Focus Group at Cornell’s Atkinson Center for a Sustainable Future, explored the importance of the United States taking a leading role in combating climate change this morning on WHCU’s Morning Newswatch. University advocates Native American farming methods [innovationtrail.org 1/18/2013] – Jane Mt. Pleasant, associate professor, Department of Horticulture, says the modern agricultural sector could learn a lot about the sustainability of natural resources from practices in Native American culture. “[The ‘Three Sisters’] system has a lot of principles that we can use in thinking about sustainable agricultural systems today,” she says. “One of the primary things is actually that it was done without tillage. We recognize that tillage, even though it does lots of good things, it also is enormously destructive of our soil resource.” Mt. Pleasant was also interviewed on WSKG radio. Energy from Willows Comes of Age [Ithaca Journal 1/2/2013] – Because of its rapid growth, willow produces eight times as much yield per acre as a typical Northeastern forest, said Larry Smart, an associate professor of horticulture at Cornell University. 800 acres of willow could produce one megawatt of electricity, enough for 750 homes for one year. See also Shrub Willow: Building a Better Biofuel [Cornell Daily Sun 1/23/2013]. MS candidate Sarah Hulick (right) won best oral presentation at the Northeast Regional Meeting of the American Society of Horticulture Sciences January 3-4 for her talk titled “Black Plastic Mulch and Transplants Increase Yield and Economic Viability of Jack O Lantern Pumpkins.” Hulick’s research will be submitted for publication this spring. Her committee members are Steve Reiners, Chris Wein, and Brad Rickard in the Dyson School of Applied Economics and Management. 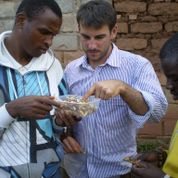 Bryan Sobel (right), a Cornell graduate student studying horticulture, is working on a master’s thesis about mushrooms and recently returned from working on a Trellis project with a women’s cooperative in Rwanda, where mushrooms are a particularly high-value crop. Sobel will continue to work with the project in the following months, as they attempt marketing their mushrooms and address nutrition-related objectives. “I want to pursue a career in international ag development, so I’m very pleased with this program, to be able to travel and do this type of work,” he said. Deanna Curtis (MS ’10) has an article in the Feb./March issue of Garden Design, “Poetry in Motion,” about the recently revitalized azalea garden at the New York Botanical Garden, where Deanna is associate curator. 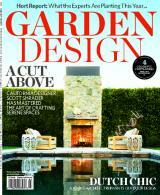 The article is not available online, but you can read a previous work by Curtis: Our Guide to Conifers. Last fall, the New York State Turfgrass Association (NYSTA) awarded its Citation of Merit to Marty Petrovic (right), professor and turfgrass scientist in the Department of Horticulture. Adding to Petrovic’s laurels, the Metropolitan Golf Course Superintendents Association (MetGCSA) has presented Marty with their prestigious John Reid Lifetime Achievement Award. “Marty has supported our superintendent members for nearly three decades through his work as both an educator and a researcher. In addition to guiding the development of countless turfgrass professionals as a Cornell University professor, Marty has initiated research that has supported superintendents in their role as stewards of the environment,” says Tony Girandi, outgoing MetGCSA board members Tony Girardi, in and article in Tee to Green magazine. The article cites Marty’s work on a comprehensive manual of turfgrass best management practices for New York and development of fertilizer management plans for golf courses in environmentally sensitive areas on the eastern end of Long Island as just two examples of his many accomplishments. The only other person to be honored with both awards was the late Hauro Tashiro ’46, Ph.D. ‘50, who was a turfgrass entomologist for 13 years at the New York State Agricultural Experiment Station in Geneva, N.Y. The Department of Horticulture kicks off it’s spring seminar series with a talk on PGRU Vegetable Crops: A Reservoir of Genetic Diversity by Joanne A. Labate, Molecular Biologist, USDA-ARS, Plant Genetic Resources Unit, Geneva, N.Y.
Read more about Labate’s research at the PGRU Seed Crops Genetic Research website. The seminar will run from 12:20 p.m. to 1:10 p.m. and originate in A134 Barton Hall, Geneva and be available via Polycom in 404 Plant Science. Panel on farming in unpredictable weather kicks off N.Y. Ag Society forum [Cornell Chronicle 1/9/2013] – With 2012 going down as the hottest year ever recorded in the contiguous United States, it was fitting that a Cornell-led panel titled “Farming Through Unpredictability” kicked off the 181st New York State Agricultural Society forum Jan. 9 in Liverpool, N.Y. Michael Hoffmann, associate dean of the College of Agriculture and Life Sciences (CALS) and director of the Cornell University Agricultural Experiment Station, explored climate change issues and responses with farmers including Jennifer Crist, whose family operates the 600-acre Crist Brothers Orchards in the Hudson Valley. The family has invested in higher elevation sites and wind machines that pull warmer air down to the orchard to prevent frost damage to buds in spring. And they are also experimenting with sun protectants and considering overhead irrigation to cool their orchard on the warmest days.